Stubble. Nicks. In grown hairs. These are some of the perils we face as we search for the closest, smoothest shave possible. They’ve plagued men and women for centuries (OK maybe not) and some of us have gone to great lengths to try to avoid these issues. Special lotions to make your hair finer, creams that “burn” the hair off, even waxing (ouch!) The answer is actually much simpler – Pacific Shaving Company. Pacific Shaving Company, a luscious line of shaving products, provides the foundation for a comfortable, silky smooth shave for both men and women. Crafted from a unique blend of certified organic and natural ingredients, these unparalleled products have a moisturizing application that will change how you feel about shaving – and won’t break the bank. Plus with each product weighing in at 3oz or less, they’re the perfect travel-friendly size for holiday getaways. 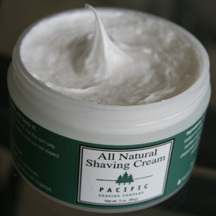 The Pacific Shaving Company All Natural Shaving Cream comes in a 3 oz. tub. 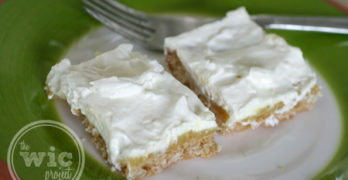 Opening the container, you’ll find a smooth, white cream that has a refreshing fragrance with what I’m guessing is a hint of lemon. Use a nickel sized amount (a little really does go a long way) of their low-lather formula on your skin and the result is a smooth, clean cut that leaves the skin feeling soft and energized. The cream is lighter than your standard shaving cream, which allows the blade to move across the skin easier. When I asked our tester about the blade oil, he simply replied, “It’s awesome.” The Pacific Shaving Company Blade Oil helps keeps the blade fresh and lasting much longer as advertised (up to 95% longer.) After shaving, simply swipe the blade oil across your dried blade and you’re helping to slow the effects of oxidation, just like that. 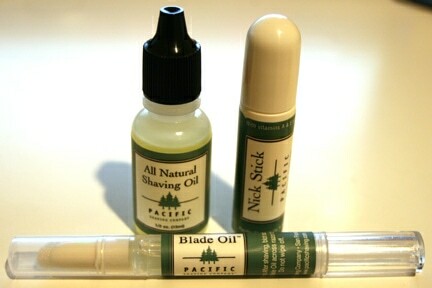 The Blade Oil is definitely something that noticeably saves money by helping even disposable blades last much longer. The three aforementioned products worked so well for the male tester that he didn’t get any nicks and therefore couldn’t test out the nick stick. Since I didn’t get the opportunity to test out the Pacific Shaving Company shaving products, I did have the need to quickly stop bleeding from little nicks. The Nick Stick is a clear liquid roll on with a light fragrance. 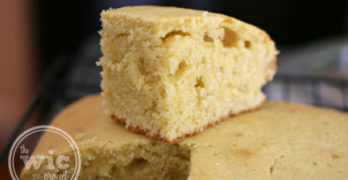 Simply dry the cut, then apply the nick stick. It may sting a little since it’s an antiseptic, but it will stop the bleeding almost instantaneously. After it dries you may be able to “feel” it on your face, but since it dries clear you nor anyone else won’t know it’s there. 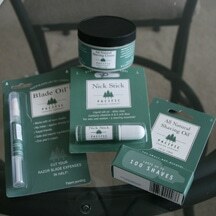 Overall I was really impressed with the quality of these shaving products. It’s bringing shaving salon quality shaving to the comfort of your home (except for the hot towel.) They delivered on all of their promises, especially the one where they’ll change the way you feel about shaving. Texture is smooth, creamy and lubricated. It has a nice, refreshing fragrance and provides a smooth clean cut leaving the skin feeling soft and refreshed. Lighter than your standard shaving cream. Rinses off the blade easier than standard cream. Never used shaving oil before and was immediately impressed with the first shave. It only requres a very thin coat of oil to get a very smooth cut. The oil has a xxxx scent. Didn’t notice any nicks at all when using the oil. It’s awesome. Keeps the blade fresh and the blade lasts much longer as advertised. Definitely something that noticeably saves money by helping even the disposable blades last much longer. Using these products has changed the way I look at shaving. It’s more of a refined grooming experience than a tedious daily chore. There is something actually enjoyable about shaving when using these products .I’ve decided never to go back to my old shaving equipment and will definitely be using Pacific Shaving Company product from now on.